Space Graveyards – what’s left behind when battles are fought among the points of light that map out the universe. Sometimes there’s good salvage to be had there. There’s always danger, though. Not everything is dead in a Graveyard, and you’re not the only one that’s come looking for the good stuff. And that’s not even mentioning the radiation and debris left behind, or the dangerous creatures that end up finding their way there like graveworms and … the undead. Use the pregenerated Graveyard At Lus for your own games, or as a guide to create your own Graveyards. 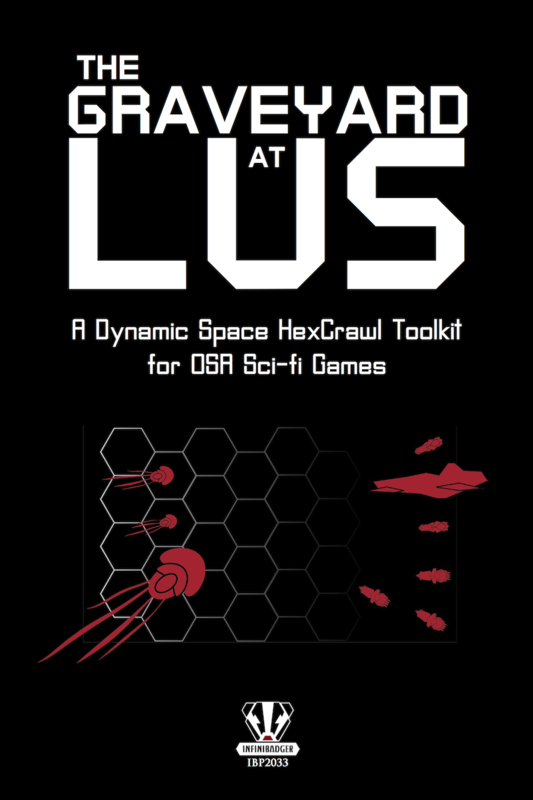 Designed for use with the White Star RPG, but easy to convert for other OSR sci-fi systems. The Graveyard at Lus will be continually supported by the release of FREE expansion material that includes additional rules and other content, including new races, creatures, and tables to help support additional sandbox usage of the product beyond the core book here. This material will not be included in the core book, but as separate products. The first of these will be the release of all of the silhouettes of the starships in the book (and many more) for use in creation of your own counters for table-based play or use with a VTT. This product is a Digital+ product.